I am thinking about remove the username field and generate something like username_123 and then give the opportunity to the user change his username later. Right now the field username is required. However, I have the fear of majority of the users not changing the default username. My fear is that some of my users won't know what to put in that field, so I'll have some bad usernames like testtest or test. Unfortunately, getting part of email as username is not an option, too invasive in this particular case. Should it be something that's required or should I generate a username for my users? having autogenerated user name is probably not good idea as they may forget it. Let them choose a username. Why not use their email address as their username, like thousands of sites do? If you need them to choose a username at a later date you can provide a screen for doing so and guide them to create one and let them know where it will be used across the site, like a message board. As the username is a handle by which the user will be known, you should make it easy for them to change it. Why not copy stackexchange? Prefill with a userID like user12345 (which may be related to your users table key field), but put the focus in the prefilled box (maybe even select the username) for the user to type their real name. (This is approximate, it's a long time since I created my logon here). If the user wants to be called "Test" let them -- for all you know it's their real name just from a culture you don't know. For that matter if they want to be called "WhyShouldITypeInThisStupidBox" it's up to them. Indicate to the user that whatever they put in the username input will be what they'll be shown as to other users. This will influence their decision and they can decide if they want to make it something weird ("sdfhsdiohspd") or something personal to them ("Frank"). If the username has already been taken, and your application needs the username to be unique, inform the user or give them some alternatives, much like Google does on signup. Also, you seem cautious on what the username can be, so you could create a blacklist of words, but I don't think it'll be foolproof, and people will find ways around it by using things such as Leet, or "impersonating" letters (ie: uppercase i becoming lowercase l). You could try adding in filters using MauriceButler/badwords or LDNOOBW/List-of-Dirty-Naughty-Obscene-and-Otherwise-Bad-Words to prevent people "cheating the system" - but then you could fall victim to the Scunthorpe problem. In conclusion, keep the username box if you don't want to publish the users e-mail and let them decide on what the username should be. The user should have the freedom to decide how they're recognised by others and how personal the recognition should be. This will depend on how important is the persona in your site. If the site importance doesn't rely on ("verified") relation between users or if whom is writing the content is less important than the content itself, maybe it is alright to give the user an auto-generated username on sign up. Automatically suggested username or Custom username. If you want to go for auto-generated usernames on sign-up, give the user the option to enter a custom username if he doesn't want an auto-generated one. This way you remove the step for the user of changing his username after he is being assigned one. 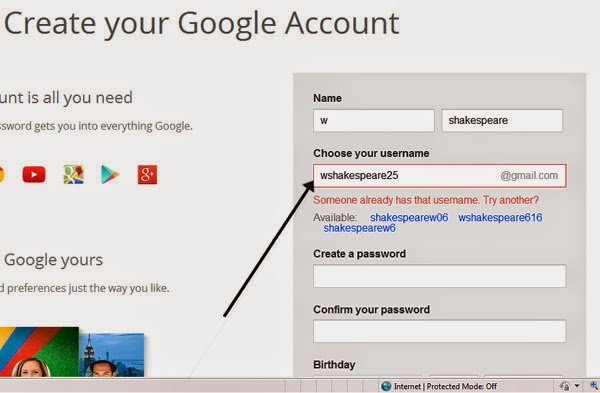 Auto-generated usernames are used in registration forms where entering a username is optional, and can be later changed. If your form requires username better don't generate it. you're violating the usability heuristic "Support internal locus of control"
interaction cost is increased because the user have to delete the autogenerated username. As you mentioned above in a comment, let the users use their email ID to login into the system. As for the system identifying the users, it's probably a good idea to take an approach similar to what Facebook does. Facebook generates a string of random numbers assigned to the user as the username, and replaces it with a chosen string if the user decides to set a specific user name for himself / herself. Since the user is not using the username to log into the system, even if he / she does not choose to customize it, they have no need to know of it. Not the answer you're looking for? Browse other questions tagged forms registration username or ask your own question. Is it necessary to double-check a user's password on registration? Should password field be cleared if Captcha is wrongly entered?